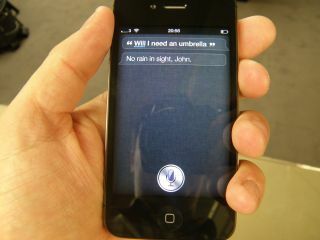 Some text in the iOS 5.1.3 beta has led to speculation that Apple will bring Siri to additional iOS devices aside from the iPhone 4S. or whatever it is we're calling it these days), the text in question seems to point to backwards compatibility. On the keyboard setting screen, iOS 5.1.3 on both the iPod Touch and iPad includes the line "About dictation link text" despite the fact that no handset but the iPhone 4S offers Siri Dictation. Now, Apple has already said there are no plans to bring Siri to its older iOS devices, but does the rumour mill believe it? Does it heck. This latest development suggests to some that older handsets like the iPhone 4, iPhone 3GS and iPad 2 will get some parts of the Siri service (like dictation), but not the full Siri experience. Of course, this could be nothing. Apple may simply be including a catch-all About page because it's been burned by privacy issues before. But it's Apple, so we had to tell you about it. It's the law.